Hi all! My name is Emily Barstow and I graduated from Trinity College in 2015. While I was a sophomore at Trinity, I started the first chapter of Protect Our Breasts. 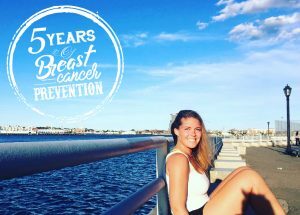 Of course my mother had founded and ran Protect Our Breasts at UMass, but I was not only starting the chapter for her, I was truly passionate. I will never forget the day the mission video was launching back in 2012. Many of the original E-Board members were all in my mother’s office and I was with them. There was so much excitement and energy in the room as we all sent out emails to friends, family, acquaintances, explaining the mission of Protect Our Breasts and asking them to share the video. Everyone in that room was ready to make a difference. In the beginning there was a lot to learn. I was starting a chapter at Trinity and being overloaded with information about which plastics to stay away from and which toothpastes are better for you. But as I started to learn, I realized that the more I absorbed and shared out to my classmates, the easier it would be for them to take the small steps to take care of themselves. I was ready to make a difference. Today, I try to encourage the people around me to make the choices that are not harder or more expensive to make. Every time I walk into a grocery store or walk down the health and beauty aisle I am reminded of my own personal decisions. At the checkout counter, I avoid touching the receipts that contain BPA. I will always buy paraben free shampoo and conditioner. For me it is not about being overwhelmed with the items I should not buy, but more about the satisfaction that comes from being educated on the issue. This is what Protect Our Breasts has given and will continue to give me.